Cardboard corner protectors are essential for protecting packaging goods against potential surface damage and strapping cuts. Damage during transport can cost manufacturing and logistics companies a significant amount of money. 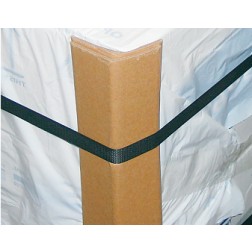 A packaging addition as simple as cardboard pallet corner protectors can prove incredibly cost effective in ensuring the goods being stored or transported are adequately protected. Edge Protectors are water resistant and can effectively withstand tension from pallet straps while efficiently protecting pallets edges. Not only do cardboard corners secure the pallet load but they also can be used to form a protective shell and facilitate even greater use of space in warehouses & transportation trucks. HIPAC Packaging Solutions are Australia’s leading supplier of corner protection packaging. With HIPAC, accessing cardboard edge protectors is easy – all you have to do is log onto our online store. We offer a great selection of high quality pallet edge protectors readily available to purchase online. HIPAC pallet corners provide a great level of stacking strength when pallets are double or triple stacked. They are an effective solution for eliminating shifting loads as well as for stabilising strapped or stretch-wrapped loads. They promise superior containment and load stabilisation most prolifically for products that cannot be stored rigidly. This greater level of stacking strength ensures that you can ship more products per pallet. A HIPAC Cardboard Pallet Edge Protector is also a very effective solution for strengthening corner posts in large cartons or boxes. They provide much needed additional support inside of cartons, effectively preventing any break-through of the packaging and enhancing the stacking strength at the corners, where packages can often be most vulnerable. All of our cardboard edge protectors are manufactured to ensure a high standard of uniformity. They perfectly match the consistency required by typical automated pallet assembly systems to ensure efficient and fast packaging of goods. Cardboard corner protectors, in combination with a solution like stretch film, can help to reduce your overall packaging costs. Replace timber and other packaging materials without compromising the safety of your packaged goods. HIPAC Packaging Solutions currently offer cardboard corner protectors in packs of 20 or 25, in 3 different sizes - 60 x 60 x 1165mm long, 60 x 60 x 1800mm long and 50 x 50 x 3600mm long. Each type of edge protector is available to purchase at an incredibly low price with even further discounts available if you bulk buy in quantities of 100 or 200, depending on the product size. Trust HIPAC Packaging Solutions for all of your office and warehouse supplies and bulk packaging needs – we’re an Australian family business with a large selection of products and fast shipping! Hipac specialises in warehouses & packaging solutions in Melbourne. We cover everything from egg packaging & cardboard boxed, through to bubble wrap & zip lock pouches. Note: A bulky item surcharge may apply on these items. Please contact us for a postage estimate.